Different? You bet they are!! Laura Vaccaro Seeger is a hands-down favorite for creating remarkable concept books for the young child and those who share them. They are so effective in helping the child visualize just what she wants them to learn. 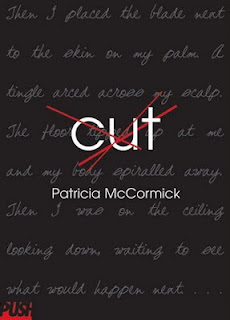 The die-cuts that she uses to entice them from one page to the next are often unexpected and always genius in design. In this book she pays homage to the color green and she does it in the most amazing ways! There are four quatrains using two-word phrases to describe the varying shades. Once she has plied us with some of the most lovely hues, she moves toward a touch of zaniness in her description of an unusually striped zebra. Kids will laugh seeing a bunch of 'wacky green' on the back of this grass muncher. If that isn't enough she moves on to more surprising descriptions that include 'slow' and 'glow', even 'faded' and 'shaded'. You can use your own imagination to think about what she might have created to give them life. The paint is thick, the papers textured, the cutouts in exactly the right place, although not always easy to find, and the perspectives forever shifting. The artwork places you right in the midst of the settings for each of the described colors. The connection from one page to the next brings surprise and delight to anyone sharing this absolutely gorgeous book! Be sure to look closely at the stop sign, and its descriptor...cool! It has a place on my 'keeper' shelf, without any doubt at all. "Elliot and Magellan rode to the library. When Elliot set him on the librarian's desk, Magellan held completely still. Ms. Stanbridge didn't blink an eye - even when Magellan blinked his." Elliott's father seems preoccupied with things other than his son. Elliott seems to be content with that. He is after all ' a very proper young man', happily reading to a large group of stuffed animals while his father scans the dailies. His father's invitation to join him in visiting the aquarium is a surprise and an intrusion; but, Elliott agrees to go. Once there, he finds his way past the mobs of visitors to the quiet environs of the penguin exhibit. He is entranced! They are Magellans, and he wants one. His father, who sits beside a poster offering plush penguins for $19.95, is agreeable to Elliott's request and hands over the twenty. Elliott makes his way back, chooses his favorite and puts Magellan (aptly named, don't you agree?) in his backpack for transport. Once there, it is pretty easy to make his new pal comfortable without anyone being the wiser. Dad is always busy with something or other, while Elliott makes certain that his pet has all the comforts of home...a skating rink, ice, Goldfish crackers, even anchovy pizza and a perfect place to sleep. What else is there? When Elliott and his father do converse, the dialogue is vague. Elliott tells his father about his Magellan research and father tells him that he did the same, at the same age, with Captain Cook. The days pass with Dad none the wiser until his bath time coincides with that of Magellan. It is a rude awakening. Funny then that he has a little surprise of his own! This is a book that only gets better with the next, and then the next, reading. The artwork created by the incomparable David Small adds gentle touches of humor at every turn. There are hints about Captain Cook that might only be obvious upon reading the book again and really looking at each and every image. 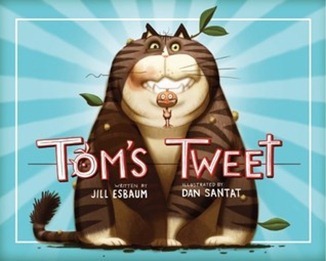 It is in a perfect picture book that text and art hold equal sway for making that book memorable. Both artists do an impeccable job of bringing us a tale to be told with wonder. "She didn't know what any of these things were or what she might do with them, but she knew that she had to have them. The little bunnies pictured on the boxes looked like they were having the most fun ever. Betty Bunny wanted to have the most fun ever." Oh, I love Betty Bunny....'she's a handful'! After falling in love with chocolate cake and amusing us with her fascination for it, I am delighted to find that she has since lost none of her chutzpah for her second story! This time, her visit to a toy store with the family results in a tirade that seems all too familiar. "Betty bunny," her mother tried again, "maybe you don't understand. You can't have all these toys." "Maybe you don't understand," Betty Bunny said. "I want all these toys." When the rule is restated, you know what happens. You have been there if you have children! Betty has a meltdown and makes the trip home without ANY toy. Unhappy, you bet! "Betty Bunny watched as her father walked over and talked to her mother. Betty Bunny hoped that her father was saying: "Stop being so mean ad horrible and yucky and give my little bunny all the toys she wants." Together, the family works to help Betty understand the mechanics of making a choice. On the next trip, she has her own money and is allowed to spend it in her own way. Young children, however, don't always learn the lessons that we want them to learn, and Betty Bunny is living proof of that adage. Once again Michael Kaplan allows us inside Betty's family life. The siblings remain real, Betty is intense and egocentric (as young children are), the parents are understanding and patient. The artwork is filled with those many wonderful details that add humor and setting for this lively family story. If you are a parent and you read to your children every night at bedtime, this is one of those books that you are sure to read on numerous nights. Not unlike Goodnight Moon and Green Eggs and Ham at our house, it will be a tiring enterprise but so rewarding as you watch the rapt attention paid to its words and listen to the soft sighs of delight as it once again comes to an end. Again! is a perfect bedtime book. It's fun, and entertaining and it offers up some humor. Put it in your nightly pile and it is sure to show up often. 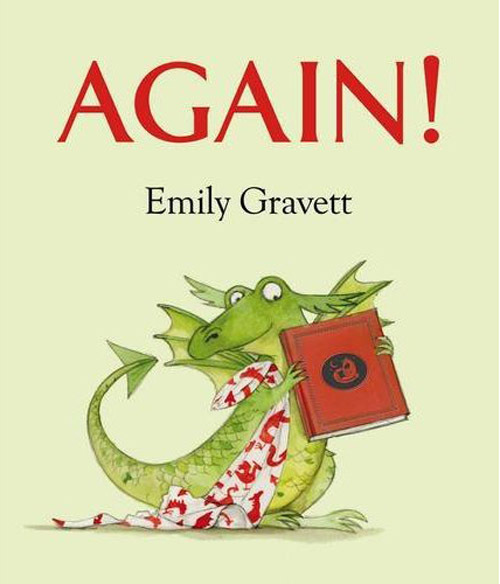 As is usual with Emily Gravett's work, the art is bright and always worthy of attention. It portrays a common experience in many reading households, and would be a perfect book for a baby shower, or that baby's arrival. Then, the new parents can await the same fate in their own houses. Cedric is the young and avid listener to his mother's soothing bedtime voice...and he almost always wants a repeat performance. She is very accommodating and patient with her young son. As she reads the tale repeatedly she attempts to shorten it and encourage her son to take to his bed. The hints are pretty obvious but Cedric is having none of it. The more demanding he becomes, the more exhausted his mom. Finally, she drifts off and does not appear to hear his loud, lamenting cries for another go. Not to be thwarted, he keeps shouting AGAIN! until he steams himself to fire-breathing status...with its story-ending result. Great imagination and a logical, if surprising, result to the constant and loud demands for further reading in a dragon household. I love the greens and reds that she chooses for her palette...perfect! Of course, Cedric begins in the calm cool greens of bedtime slumber and works himself up to the fiery reds of disillusionment and frustration. If you don't have Emily Gravett books on your bookshelves, start here! 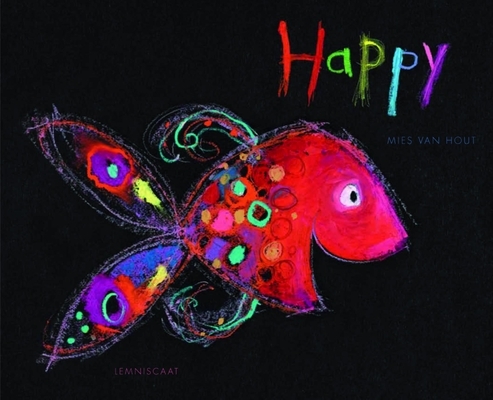 This beautiful book, translated from the Dutch, runs the gamut of emotions from shy to proud, surprised to brave, and many more. One per page, accompanied by a spectacular piece of artwork to show a small fish as it experiences these many emotions and yet we are totally unaware of what caused each. It is the fish that holds our attention and gives a most accurate portrayal of the named feelings. They sizzle in brilliant color, from scarlet to turquoise and fiery orange to royal blue. They swim on a black background to emphasize the emotional impact of whatever is happening beyond our view. The words are written in childlike print placed on textured sheets, the colors chosen to enhance and deepen mood and the changing lines to give life to everything being shared. I guarantee that you will return time and again with wondrous eyes to see these compelling images. What a lovely discovery when I was at Bolen Books last week...thanks to Freda for showing it to me, and to Maddy for bringing it to her mom's attention. I always look forward to something new from Ashley Spires. She has a great sense of humor and a storytelling ability that is to be admired. 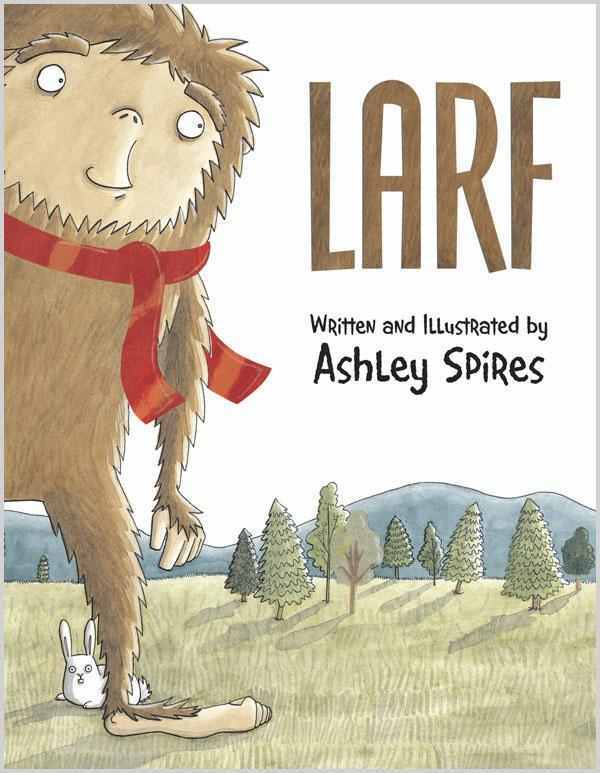 In her newest tale, we meet LARF, a bigger than life man with a soft heart and a penchant for peace and quiet. Big? Yes! Well, he is a sasquatch. He is big and he is hairy and he looks a bit like an ape, with all the human qualities one might want in a main character. He likes being by himself. He lives deep in the forest with his pet bunny Eric for company. He is pleased with his life and has no need to bring attention to himself, despite the fact that he is a bit of a celebrity...being the only Sasquatch in the world. When he reads that another of his kind is to make an appearance in a nearby community, LARF is intrigued and a slight bit apprehensive. He decides to make the short trip to see 'the other one'. A friend might be a nice addition to his fairly solitary life. Not wanting to be singled out, or recognized, he dons a disguise that he is sure will not attract any attention (including a bunny shaped backpack). Upon arrival he sees that said Sasquatch is a guy in a costume...a BIG FAKE! As often happens LARF is not the only one interested in a new life form. It turns out that someone looking very like him, with feminine attributes, is also fascinated by the poster proclaiming a monstrous town visitor. She and LARF meet, and we are left to wonder if there might be a shared tale in their future. There is so much fun in the illustrations, including the gullibility of the attendant humans who do not seem to recognize a large, apelike being among them. The speech bubbles are great. The setting is perfectly drawn to accommodate the reclusive nature of the creature at the center of the drama. I am sure you will find yourself rooting for LARF and his new lady. It's entertainment for the whole family. "Not many people know this, but squirrels are the cleverest of all the woodland creatures. In fact, they're fuzzy little geniuses! They can make a house out of a tree, a bed out of a bunch of leaves, and a box kite out of twigs, dirt and squirrel spit. They are also excellent at math." Our Aunt Sandi is not going to like this book! She has had a hate on for squirrels since the first one settled itself in the attic and became nocturnal...keeping her awake at night plotting its demise. She didn't like them any better when they found their sneaky way into almost every 'squirrel proof' bird feeder she bought for the backyard birds. "There were whirley birds and bonga birds, baba birds and yaba birds. Even a rare floogle bird came by once or twice. Fookwire's paintings weren't very good, but the birds never said anything." Ah, but the squirrels. It appears that they also have a penchant for the feathered fliers. Well, maybe not the birds but definitely their fodder. No matter what is devised to keep them at bay, they find a way to get at that food. The battle for supremacy begins. Decide, if you will, the victorious. The artwork takes this offbeat story and makes it even more so! It's all so much fun. Take a look at the angry bird atop Fookwire's head on the cover art...aping the old man's fist and veiled threats. 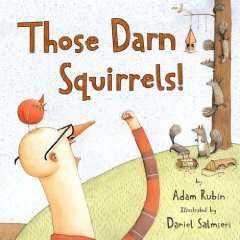 The telling is in the details and each page offers a new look at the ingenuity of man and the animal kingdom...especially those darn squirrels! "He had greeted me warmly, and as I took my place opposite him, I felt the strange sensation that I was awakening from a dream. It was as if the last two years had never happened, that I had never met my beloved Mary, married her and moved to our home in Kensington, purchased with the proceeds of the Agra pearls. I could have still been a bachelor, living here with Holmes, sharing with him the excitement of the chase and the unraveling of yet another mystery." My thanks to Erin and Drew for this most appreciated and wonderful gift, received when I arrived at their house to spend a lovely holiday with them. It has captured my attention from the first page and I am even more convinced that I must spend some time reading more of Sir Arthur's tales. I must admit that my intrigue with Sherlock Holmes grew exponentially through reading Shane Peacock's Young Sherlock Holmes cases, published by Tundra Books. All five cases have held my interest start to finish, and I am quick to recommend them to young readers looking for mysterious and mesmerizing stories. I am also a fan of Guy Ritchie's Sherlock Holmes movies, and have been interested in seeing the many connections made between text and film. This story by acclaimed and prolific author Horowitz has the full endorsement of the Conan Doyle estate and is the first time they have granted a contemporary author the approval to write a new Holmes novel. He has done so, with aplomb, wit and a researcher's skilled eye for keeping to the tenor of its many predecessors. "There were times when I thought him dead. Only a week before, indeed, I had observed him helpless and delirious supposedly the victim of a coolie disease from Sumatra. Then there was that time at Poldhu Bay in Cornwall where, had I not dragged him from the room he would certainly have succumbed to madness and self-destruction. I recall my vigil with him in Surrey when a deadly swamp adder came slithering out of the darkness. And could I complete this brief list without reminding myself of the utter despair, the sense of emptiness that I felt when I returned, alone, from the Reichenbach Falls? And yet, all of these pale in comparison with that night in Bluegate Fields. Poor Holmes. I see him now, recovering consciousness to find himself surrounded, under arrest and quite unable to explain to himself or anyone else what had just taken place. It was he who had chosen, willingly, to walk into a trap. This was the unhappy result." The London setting and his bleak atmospheric descriptions recall other tales, and the heartbreaking conditions for children of the time. It is the death of one such boy that sets Sherlock on a mission to discover his murderers. In doing so, he becomes the target for a secret society of powerful men who will stop at nothing to keep those secrets. "From this, and from other indications in his behavior - he mentioned, for example, that he might never call upon the services of the Baker Street Irregulars again - I gathered that he still blamed himself, in part, for the boy's death, and that the scenes we had witnessed that night on Hamworth Hill had left an indelible mark on his consciousness. Nobody knew evil like Holmes, but there are some evils that it is better not to know, and he could not enjoy even the rewards of his success without being reminded of the dark places to which it had taken him. I could understand this. I had bad dreams myself. But I had Mary to consider, and a medical practice to run. Holmes found himself trapped in his own particular world, forced to dwell on things he would rather forget." I think you should read it, and it is certainly is one of those books I would suggest to mystery-loving high school students who don't mind a dark and gritty read. But he also felt sad. never be the Easter Bunny. Liam knew they were wrong. what if they were right?" Liam is young piglet with self-esteem oozing out of his pores. He has knowledge that he does belong to the pig family, but he is much more interested in being the Easter Bunny. To that end, he practices hopping, and enjoying an occasional salad, even delivering practice eggs. His progress is measurable. His family is not sure about his life choice and try to discourage him from following his dream. His siblings think he is a little simple-minded, while his parents love him just as he is and wish he could be happy to be so. Liam is determined, and set on changing his own destiny. And fix it they do...with a little help from the internet, leaving Liam to live his life as the Easter Bunny he has always seen himself being. Laugh out loud funny, while also poignant and uplifting; young readers will want to share this story repeatedly. Jeremy Tankard creates his characters using thick ink outlines, expressive faces, movement, and variety in perspective. It is wonderful in every way and a perfect Easter gift! To come to learn of you." This is exactly the book needed to encourage middle graders and high school students to begin to explore the history of the Metis people. It would be a welcome readaloud in intermediate classrooms as well. David tells the story (a piece of his own personal history), Dennis Weber's striking illustrations give life and meaning to the beautiful words and John Arcand provides musical accompaniment. It is a wonderful collaboration! It is interesting to note that Dennis Weber is directly related to Metis leader Louis Riel, known as the father of Manitoba and a noted poet himself. In 1885 he is quoted as saying:" "Our People will sleep for a hundred years, but when they awake, it will be the artists who bring back their culture." The cover shows David in a vintage Hudson's Bay Company blanket coat that is so familiar to Canadian culture. The reflected image in a hollowed-out log is that of his grandmother (you can find her picture on David's website) and is an apt metaphor for the story itself. He did not know about his grandmother for many years, and this book pays homage to her memory and sadness at not knowing about her earlier than he did. There is much here to discover about Canada's history and the interaction between the European settlers and the established aboriginal community. Today's Metis work hard to teach their children the language and culture of their ancestors. Michif is the language, and is said to be a blend of Cree and French. It is experiencing a resurgence in interest. David is proud of his Metis heritage and honors his ancestors with his story. It is an apology of sorts, for not knowing more at an earlier age. Many Metis were encouraged to be ashamed of their ancestry in earlier times; now, they are searching for the names of their forebears who became part of a predominantly white culture. David's grandmothers were Anishnaabe, Chippewa, Menominee and Innu. He honors them today as he searches for his roots and passes on what he is learning to his readers. The CD that accompanies the story includes a reading in English by the author, fiddle, pipe and drum music led by John Arcand and a second reading in the Michif language by Norman Fleury, a Manitoba resident. It is a winning mix of text, art, music, and the oral tradition of the Metis nation. Written in four line stanzas, this is poetry that is part memory, part regret, and part hope for the future of Metis story, culture and song. "In a country cottage, there lived a lovely peasant girl named Giselle. More than anything, Giselle loved to dance, but her mother worried constantly. "My girl," she'd warn, "please be careful. Your heart. Too much dancing could." But to Giselle, dancing was far more important than a weak heart." Rajika Kupesic shares three ballets in this beautifully designed picture book. Since I am not a ballet aficionado, I had no real knowledge of any of them, but came away from the reading with an understanding for their story and in awe of the artwork designed to depict them. In her introduction she describes the origin of the title. The term is meant to underscore the identical white costumes worn by a group of female dancers who act as a backdrop to the prima balllerina. They perform in unison as one entity and their power comes from their skill at doing so. The first two ballets chosen are special to the artist as they were among her first performances as a young dancer and then as a graduate of the National Ballet School of Zagreb. Those are Swan Lake and Giselle. The third is called La Bayadere, a ballet not in her repertoire as it was only danced in the USSR. Ms. Kupesic tells readers that the three are among the most important works for the ballet blanc style of performance. As a classically trained dancer, she uses her brilliant artistic talent to bring the fluidity and movement of the ballets to her audience. As she works on her paintings she listens to music and uses its grace and flow to design the works in progress. She seems uniquely qualified to bring life to the dance she loves so much. I like that she shares the story of the ballets in language that is clear and conversational, making them accessible for a young and specialized audience. In notes about each ballet she explains their history and also ensures that her readers understand why she painted each image as she did. As you can imagine, this is a book that would be most appreciated by an aspiring dancer or those who share a love of ballet performance seen at the theater. "Creating a very simple fold is actually quite complicated because I try to use a minimum of material for maximum expression. Every fold is a humorous wink at life. For each model, I invite you to appreciate the subtleties of its construction, its beauty and its gracefulness." Well, here I am in British Columbia for a long and lovely visit with my daughter and son-in-law. It is spring vacation here and there are kids everywhere I go. I remember wanting to find books and activities that would keep the kids busy while we were at home. It's always interesting to search for things to keep vacationing children busy and learning something new; spring break seems the perfect time. I could never make a really successful paper airplane, but I am willing to give it a good old college try! I am truthfully more intrigued by the craftsmanship of accomplished origami artists. In this new compilation of some of the projects designed by Didier Boursin and described in three earlier books, kids and their parents will learn about the ancient art which dates back to the 17th century. And there isn't just one airplane in his repertoire...there are more than twelve of them and one is a helicopter! He groups the projects in three categories...beginner. intermediate and advanced. Other suggested designs include animals and birds, toys and decorations. Paper folding is quite the amazing skill to learn, and it's much easier to accomplish if you follow these step-by-step directions given. A clear photograph accompanies each described project and gives attention to every detail. The author's suggestion to start with an easier one is his best advice. I had trouble making one that looked like his. Kids will find fun in trying, and great satisfaction in their own accomplishments. Practice makes perfect, right?? If it's worth doing, it's worth doing well. As you become more adept at paper folding, your skills improve and provide encouragement to try another...and then another! Add a package of beautiful square papers to the book, and you have another great birthday (or spring break) present. Well, if you were graduating high school in the late 1960s as I was, this would have been one of the songs that found constant play on the radio. It became a bit of an anthem for those of us who were doing our best to look forward and move on with our lives. Brian Deines' remarkable images give it new life and provide an introduction to the lovely lyrics created so long ago. If you don't have a copy of it in your own music library, try YouTube or Itunes to find a version to share with your listeners. Having the chance to hear Joni Mitchell sing it while you read it together is such a special experience. As with many folk songs, the words in the performance and the words printed in the text of the book are not the same...but, they are similar enough to keep the message strong. In twelve double-page illustrations the artist shows a young boy's journey through life...the central theme of Miss Mitchell's memorable and much-loved song. He is captive on the carousel and life moves along with him. The backgrounds change from light to dark, showing the passing of the days and nights of his life. There is little to say about the song itself, already familiar to so many. It is Deines' interpretation that makes it come alive once more. At the end, readers learn about the songwriter, her life and her many important contributions to music and the Canadian culture. There is also information shared about the artist and his many successes in the art world. I wouldn't even mind singing it myself...but that might make it a lot less pleasureable for the captive audience. But, I am pleased that I remember those words so well! "She didn't know how to make the other children like her, and she felt she constantly had to defend herself from unspoken accusations about a way of life she hadn't chosen to begin with. Well, she thought, who needs them? I bet none of them know how to make plumbing repairs. I bet none of them have read Pride and Prejudice. Twice." 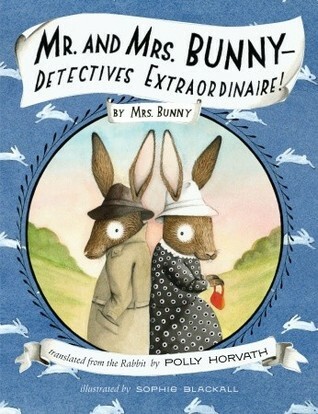 Everyone in Polly Horvath's newly created animal and human fantasy world is eccentric, I think! Their story made me smile again, and then again. I found it happening all the way through the reading and I am so happy to have spent my Saturday with Mr. and Mrs. Bunny and Madeline, and various and sundry other decidedly weird characters. "As nature often has it, they had a child who did not want to join them in their all-day pursuit of enlightenment and a better mung bean. Instead, she became very good at cooking and cleaning and sewing and bookkeeping and minor household repairs. She was the one who changed the lightbulbs." "Mrs. Bunny lives in Rabbitville, in the Cowichan Valley, on Vancouver Island, British Columbia. She is married to Mr. Bunny and has twelve children. This is her first novel." When Madeline's parents are kidnapped by foxes in need of a code-breaker (their Uncle Runyon is such a man) and a ransom note is left, but no clue to their whereabouts, she enlists the help of the newest detectives in the area. While with the Bunnys she learns much about family life, about patience and about counting on others when the going gets tough. "She is not our friend because she is..."And here Mr. Bunny paused for dramatic effect. He paused so long that several councilbunnies went out for coffee. One had time to order a short decaf double shot no whip mocha iced frappuccino to go. Mr Bunny paused so long that when the councilbunny's coffee came, he had time to change his mind to a venti semi-skim soy no sugar caramel macchiato with no whip but double caramel and a reduced-fat skinny poppy seed and lemon muffin, hot, no butter. When the councilbunnies got back, Mr. Bunny was almost done pausing. The sipped their coffee and turned their attention back to him." I haven't even mentioned Sophie Blackall's illustrations. They give visual life to the characters and add power to some of the swift plot changes. I love Mr. Bunny's platform shoes, which give him enough height to drive a Smart car and the warm familiarity of Blackall's characters. The energetic dialogue, the quick pace and the wit in the words have me hoping that this is not their only tale. I would love to be privy to their next case; now that they are experienced and successful! "Even in the fading light I could tell the house was a disaster; it looked like it'd been ransacked by thieves. Bookshelves and cabinets had been emptied, the knickknacks and large-print Reader's Digests that had filled them thrown across the floor. Couch cushions and chairs were overturned. The fridge and freezer doors hung open, their contents melting into sticky puddles on the linoleum. My heart sank. Grandpa Portman had really, finally lost his mind." Encouraged by my daughter and the many rumblings I had heard about this 'peculiar' story, I read it while on holiday in British Columbia recently. Erin was right; I could not put it down once I started reading and now, three weeks later, I find myself clearly remembering many scenes (though not the intelligent and intriguing dialogue) from it. That was unexpected when I began. Ransom Riggs uses old photos to give an eeriness to the telling and to the events that lead Jacob and his father on a trek to a remote Welsh island in search of further information about his recently deceased grandfather. Grandpa Portman's death is sudden and tragic. The police blame a dog pack. Jacob knows better. He saw the beast that did the killing, and knows about it through stories told by his much-loved grandfather. 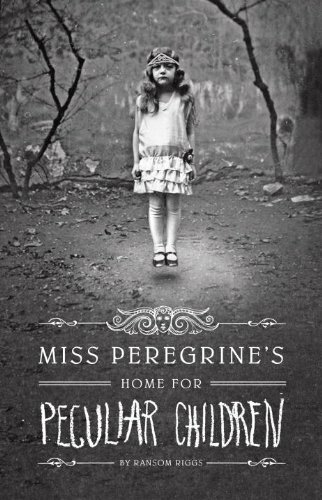 When they reach their destination, Jacob is compelled to find the orphanage where his grandfather spent some of the war years under the care and tutelage of a kind and loving woman named Alma Peregrine. He finds the ruins of the house; and soon discovers so much more than that. The secrets that he unearths set him on a mission to save his loved ones. In searching for a solution, Jacob discovers that he is more than just an ordinary young man. photographs from collectors who have 'found' them while searching through boxes at flea markets, malls and yard sales. Among the many finds were pictures that helped him imagine this remarkable book. He uses them as illustrations as the novel moves forward, and they help him create quite the adventure for Jacob and the 'peculiar' people that he meets while combing the island. It moves quickly and is sometimes chilling. should look forward to hearing from Jacob again. I'll be waiting right alongside you. "Resplendent in an emerald green tunic and a shimmering golden kufi cap, Pa Sorie moves to a chair outside. Children circle around him as he talks, joking with us and with him. Old people are honored in Kamakwie. Living long is something to celebrate. It does not happen often enough." This book sits on my coffee table and the two faces on its front cover are a constant reminder to me to count my blessings, and teach a lesson every day in love and family. 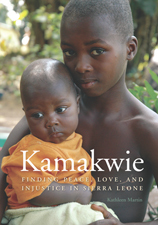 Life in Sierra Leone is not easy, but it showed Kathleen Martin what love and hope means to so many who live there. If you do not feel that love for the inhabitants of this West African country while reading this book, I will be very surprised. It is so easy to be oblivious to the hurts and atrocities that happen far away from us...books like these remind us that the people of the world must care for the people of the world. Kathleen Martin shares many stories...stories that are filled with hope and love; others that speak to the violence and horror that many Kamakwie inhabitants deal with in their too short lives. While there, she was housed on hospital grounds which allowed her access to many visits and conversations with village inhabitants. What happened during these encounters was an eye-opening discovery for her. The civil war was the focus and she wanted to know about their memories, their hopes for the future and the repercussions for each of them. She was most amazed to learn about the children...what they loved despite what had happened to them, their enthusiasm for each new day, their love of soccer and laughter. They sang together and played competitive games, all the while enticing the photographer to join them and to become one of them. Through her own eyes, and the camera's focus, we see their world. As we watch, we need to keep in mind that we are far removed from what the people of Sierra Leone deal with each and every day. The reality is heartbreaking and uplifting. We, who are so blessed and indulged and too often want more; they, who have little and are happy with what they have. Is there a message for each of us? Did we have knowledge of their civil war while it was happening? Did we do anything to help? I know what my answers are, and I am not proud of them. Each short chapter is about the people. They share joy and despair. They are sad, and they are recovering with little revenge in their hearts. While this book could be depressing, it is not. It is a testament to Kathleen Martin's ability to see and share their joys and their belief in a future that makes it so worth reading! Please do that...you will not be sorry that you got the chance to meet these truly beautiful children. It might just be the impetus needed to follow your heart and make your own difference in this world. "Moms are highly portable. You can take them almost anywhere with little or no advance preparation or additional accessories. Taking them along with you also gives them brief exposure to natural sunlight, which they enjoy." This is a book that will suit reading over the course of a few days! It has lots of text in its fifty-four pages and many different scenarios that kids will find funny, but which will also be appreciated by the adult who is reading it. The Moms described range from the prehistoric to the present. Mostly it is about moms today, and all the trials and tribulations that children face in trying to keep them operational. They are reminded that daily quotas of sleep, nutrition, exercise and water (SNEW) are much needed and overwhelmingly appreciated. Should moms miss out on any of the four, trouble is sure to ensue. 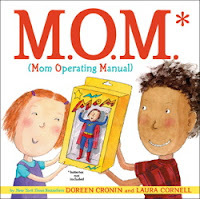 Doreen Cronin adds humor to every page, encouraging those moms who try so hard to be the best they can be to see themselves in its pages and feel that they are doing all they can. In an age when knowing how to parent (and do it right) is as close as a Google search, moms are sure to find themselves somewhere within these pages. But, it's a long read and they may not have time to share it fully. That of course depends on how serious they are about always doing what is best and right! A little tongue-in-cheek? I think so! Moms are pretty 'advanced human models' and should be appreciated for all they do to make the world go round. Just like everything else that runs on and on, they do need timely and appropriate maintenance if they are to 'keep on ticking'. This manual may provide just the right guidance to ensure their longevity. Grooming helps, and a troubleshooting section should provide additional ideas when all seems lost. There are laugh-out-loud scenes,. Word choice and the manual style of writing is imaginative and attention getting. Kids will find it funny. Moms may even find it hilarious and will want to share it with their friends. Laura Cornell's illustrations add to the fun, and suit the mood perfectly. I am little, but very strong. as I race across the savanna. Both of these books were published earlier in hardcover editions. They are reissued now as useful and informative paperbacks for young and eager scientists to use while doing research, or building knowledge of animals from around the world. "Beluga Sturgeon: Call me a living fossil - I can live for one hundred years. With rows of bony scutes to protect my sides, I cruise in salt water. I migrate up a river to spawn." The text is easily understood and accessible for young readers and offers a quick look at some of those creatures they will find very interesting. Following the comparisons, the author provides a grid that helps her audience see big and really big on facing pages. On the next page, she creates some actual size illustrations that small and really small and shows the actual size of some of them. "Hylonomus: A pioneer, I climbed out of the lagoon onto dry land. Being cold-blooded, I warmed up and cooled off along with the temperature of the air around me. Panther Chameleon: I have feet and a prehensile tail, just right for clasping branches. My skin changes color according to the light and what mood I am in. My tongue is lightning-fast." A timeline follows the text, plotting many of the described creatures. It begins millions of years ago. Both have a useful and condensed glossary to help a young audience understand certain terms. Both are books designed to help introduce children to the natural world in an easy and informative way. No words could adequately describe the beauty of the photographs that show what is being done to our world today, and what it could be if we care for it for the future. In this 32 page book of well- chosen, clear and spectacular images we can learn much, without one written word. There are 14 pairs of photographs. As we begin our 'reading' on the left hand side, we see fire burning on a treed hillside and smoke rising to obscure much of the view. On the right side we see verdant foliage, brilliantly green in warm sunshine. The message is strong and will be interpreted differently according to the age and knowledge of the reader. Young ones may just see it as a forest fire and worry at its power. Older children, knowing that lush acres are burned off to open up land for farming while pushing its natural inhabitants further afield, will see it from a totally different perspective. Each set of photos is equally stunning, leaving much room for discussion. A man with a chainsaw fells a tree, while another digs gently into soft earth to plant something new. A captive parrot sits caged while its identical partner sits atop an evergreen in the wild. A polluted and motionless water pond pales in comparison to light dappled rocks shining through a free flowing waterfall. A rocky beach is strewn with the dead bodies of large turtles while another swims freely in a cool blue ocean environment. Plants dead or dying in a polluted pond while greenery finds vibrant life in a clear, clean stream. A proud and elegant seal trapped around the neck by a discarded garbage ring while another, with the same proud demeanor, gleams in brilliant sunshine. A smoky forest filled with downed and blackened trees faces sunlight scattered over the ferns and lush greenery of a healthy forest. A lethargic, uninterested lion lying on a bed of cement while another dashes for food in its natural environment. Sawed lumber and sawdust lying strewn about a green park while the healthy canopy of a large and leafy tree invites neck-wrenching adoration, perhaps in that same park. A glassy-eyed jaguar rug stares blindly while its regal and very much alive counterpart stares languidly from the cool leafy floor of its natural home. A cracked and weedy sidewalk with tree stumps sticking up through patchy earth while a tree-lined shaded pathway invites peaceful walks and companionship. An oh so familiar garbage-strewn hillside allows the wind to take it hither and yon while a full trash can awaits the truck that will transport it to a landfill or recycling center. Finally, the back endpapers show six lanes of bumper to bumper traffic polluting the air around while a lone cyclist zips past the camera's lens. Not much to say, is there? It is a book that will inspire deep conversation when shared and it will open the minds of children to some of the simple and effective ways one person can make a difference in our world. Depending on the age group sharing this frank and hopeful book, that conversation could lead to many new discoveries and actions. With Earth Day just over a month away, it is a perfect buy. "He had his own house. He had his own schedule. 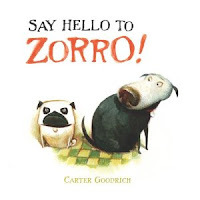 Those of you who love pets, get ready for rip-roaring fun with Mister Bud, and ZORRO! Mister Bud loves his life and has no clue that all of that is about to change. He spends his days with everyone keeping to the schedule that he has established. His environs are totally HIS, and he rules the roost in terms of meals, walks, cuddles, movies, backyard play and the all important naptimes. When Zorro comes on the scene, Mister Bud is disgusted. Zorro is 'pug'naciouos, grumpy and likes to the 'boss' of all things. It is an abominable state of affairs; but the two are left to their own devices to try and make a relationship work. It takes time, and a whole lot of effort. As with most change, common ground must be found. In the end, they find that they have some pretty important things in common. Not only do they share a penchant for strict schedules, they also have a similar view of cats. The watercolor illustrations are filled with soft color and lots of white space, giving the reader a real feel for the contentment that is Mister Bud's life. Cool greens envelop him in placidity and we just get a glimpse of his demanding nature when he asserts his control over the schedule. His demeanor is altered dramatically and visually when Zorro arrives. The expressions are delightful and mischievous, lending a humorous and attention grabbing quality to each page. The charming looks, the endearing love for their people and the excitement when they discover a mutual love are well portrayed. Your children will love it when you read this one aloud. Enjoy! "So while Clarence didn't feed his kids, had never let them go to school, and had ripped them from their mother's mortgaged-for-more-than-it-was-worth home while he had robbed his way crisscrossing states for ten years - he made sure to shave every morning and keep himself neat and tidy." I was terrified of Clarence from the moment I met him, and it made reading this book very difficult at times. But as much as I disliked him and what he did to the boys who were his sons, I LOVED Sam and Riddle with all I had in me! There are two boys who will remain in my heart. That is true of most of the characters that Holly Goldberg Sloan has brought to life in her DEBUT novel. Unbelievable!!! "Sam knew that, if it weren't for his little brother, he'd have been even more damaged, even more messed up, than he already was. Riddle had given his life purpose. And Sam would always, no matter what happened, not just protect his little brother but try to think of him first. And so Sam kept his hands to himself, off the steering wheel and off his father's neck." 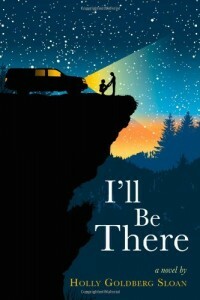 Sam's love of music takes him to a church where Emily Bell is singing...and that moment sets them on a path that rarely slows, and is always headed toward disaster. That encounter is the first of many that kept me reading. No matter what happens today it leads to something new tomorrow. Readers get a constantly changing perspective from each of the cast of amazing and significant characters, go to places that are warm and lovely, and cold and menacing. It is the connections that intensify the emotions felt as the twists and turns break your heart and then soothe you. Thank goodness for some humor, and for Felix. It is a story about family...the good and the bad. It is about relationships, music, caring deeply and being lucky. Be sure to go the author's website...http://hollygoldbergsloan.com/ and read about the book and listen to the playlists that she has created for her characters....they are just great. There are so many coincidences that I want to tell you about, but I won't. I will let this marvellous first time author tell you the story. You need to have this book! It's my favorite in a long time...and I read great books all the time. This one has that something special. "She did work performed by few women: counting deep-sea fish in foggy, dangerous currents south of Nova Scotia; observing reef animals in a special suit with an eighty-four-pound diving helmet off the coast of Florida; tracking alligators atop a rumbling 'glades buggy' in the swampy Florida Everglades." Were it not for people like Rachel Carson who see what is wrong in our world and then do something about it, we would be in a more precarious position than we are today. This quiet, peaceful story about her life seems in keeping with her character and all that she did to make the world a better place through her love of nature and her dismay at the state of nature in the mid 1950s. Were it not for people like Laurie Lawlor we would not be able to share such stories with our students, and our own children, to show them the strides made in human history because one person cared! 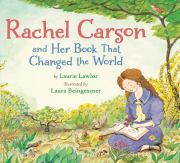 This book is a most welcome addition to my growing list of picture book biographies that can be used in classrooms to bring history to life and to inform our young people about the many who have made a difference in our world. "Once you are aware of the wonder and beauty of earth," she scibbled in her journal, "you will want to learn about it." "As early as 1945, Rachel had read about studies of declining bird populations across the country. Each year researchers reproted fewer nesting and migrating birds. The more she investigated, the more alarmed she became." "Silent Spring not only saved many bird species; it also opened the minds of millions to what was considered to be a new concept at the time: what we do to the air, water, and soil directly affects us, future generations, and animals and plants that share the earth with us. Rachel Carson demonstrated how one committed person can make a difference." BRAVO! "Your eyes widen slightly. "Is that how it feels?" "That your mother doesn't want you around so she can be alone with your brother?" I don't how exactly, but somehow I've said something I didn't mean to say. Something that's not quite true." I should have read this book long ago. It has been there on my pile of books to be read. When I did read Sold I was certain that I needed to read anything else this fine author wrote. Finally, I picked it up and then couldn't put it down! "She does what I do." I watch for your expression to change, for there to be some slight shift from neutral to...to what? Disgusted? Disapproving? You wait calmly. "She showed everybody her scars." I bite my lip some more. That's it. I'm finished. I listen for the plane, but it's gone. "You think she should have kept them to herself?" "Do you think this new girl should have kept her scars hidden?" It is a realistic look at Callie and her world. She is at the facility but she is making no progress and there is a chance that she will be released if no one can help her. With the arrival of Amanda, and some support from the girls who are also being treated, she begins to find her voice and speak with her therapist. Only then does she recognize why cutting eases the pain she is feeling. her mother's full attention. Dealing with family issues has led Callie to try to numb the pain by hurting herself. It is only through her own strength of character that she finds the courage to make changes and perhaps find hope for the future. This is a quick and powerful read, detailed in terms of Callie's difficulties and in the end, hopeful and always real. "The sky over St. George's Street was gray, and the buildings were gray, and people wore gray. It sounds like a cliche, but it was true. Going from Los Angeles to London in 1952 was like leaving a Technicolor movie and walking into a black-and-white one." Janie Scott begins by telling her readers about her idyllic California existence in the early 1950s, following WWII. Her parents are funny and articulate, oranges picked in her won yard drip juice down her chin when eaten, and the ocean regularly calls to her to bask in its waves. Then one day she is followed home and McCarthyism changes all things for her family. Her parents have been subpoenaed to court and they make the decision to leave the US and head to London where a job awaits. They are wildly enthusiastic about the move, and try to convince their unhappy daughter that all will be well. When Janie sees the grim reality the war has wrought in England, and begins to learn about the deprivation that exists there, she is stunned. They use ration cards for shopping, food is scarce and chocolate is non-existent. Add to that attendance at a brand school where uniforms are required dress and the hierarchy is already established, and Janie is even more apprehensive. "Benjamin slumped back in his seat. "It's not nineteenth-century, it's just English," he said. "There's an expectation." "That you become what your father is?" "In some cases. In my case, The Society for Apothecaries pays my school fees, and I wouldn't be in St. Beden's without them. 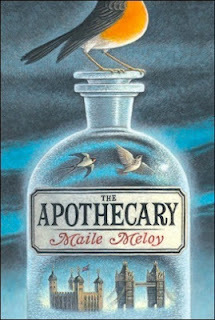 I'd be at some grim secondary modern..."
It is when Janie and Benjamin go to the apothecary shop that things come unravelled. Mr. Burrows is frantic to protect his son, and the Pharmacopoeia (a book filled with recipes for medicines and old ways of healing hurts) from the sinister, evil men who burst into his shop. He hides Benjamin and Janie, and when they come out of their undiscovered hiding place, the apothecary is gone. Thus begins a harrowing journey that puts them in touch with corruption, spies, arrest, a small group of scientists from around the world who are trying to stop a planned Russian atomic test, and Pip. They meet him while they are being held in jail, and he is a welcome addition to their band of good guys. Using the Pharmacopoeia and its contents, they work to foil the testing. Meeting the other scientists helps them to understand the impact and danger of the cold war. "So we weren't, as you see, very good at being sneaky. We had interrogated our own ally in a bugged house, and turned into birds in front of the entire population of Turnbull Hall, and now we'd hustled the St. Beden's chess club in the space of five minutes." Ancient arts, the postwar fight for power and control, adolescent attraction, loving families, an amazing narrator who tells her story with clear-voiced panache, and a very surprising ending. What more can we ask to enthrall and delight a middle grade audience? 'Rolf liked being a good little wolf. He liked baking tasty cakes. He ate up all his vegetables. I am in awe of authors who can pull them off; and especially first time authors! It takes humor, talent and a healthy dose of knowledge about fairy tales to create a book that is sure to appeal to kids from kindergarten to middle years. Rolf is a 'good little wolf'. He does all things expected of those who are good and the fact that a wolf's behavior is not always considered such is only the beginning of his tale. The storytime regulars, in attendance to hear a new adventure, will be familiar to those who have some experience with fairy tale characters. They include the three pigs, Red Riding Hood and the woodsman...oh, and Rolf! Mrs. Boggins is Rolf's best friend and she appreciates that he is an alterego to most wolves that are known to humans. She warns him against others, who are not like him. As might be expected, it isn't long until he meets the real villain of so many stories. The Big Bad Wolf assures Rolf that wolves are not supposed to be good...and he will mentor him in needed skills to take a real and expected role in the world. Rolf is an inept pupil. It seems his destiny is tied to goodness. What about a turnabout? 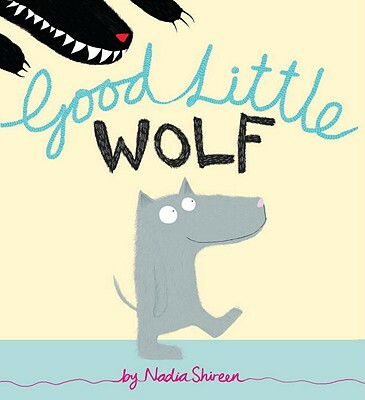 Will the Big Bad Wolf try being good? He says he'll give it a go...maybe tomorrow!! The artist creaters wonderful, wacky illustrations that will capture attention and keep listeners involved and wanting more. Use of white space to give perspective and dark and light to show opposing sides of the good and evil spectum add to the humor and the appeal. This is an auspicious debut picture book. I will be on the lookout for her next one. "My mom says it's because he is special and likes to play in a different way. That's why he lies by himself and doesn't play with us. But sometimes I wish, in an embarrassed sort of way, that he would just join in our games." I often find myself apprehensive when a book appears to set out to 'teach' its readers something. My worry is that it will be seem didactic and lose its impact. When this book arrived in the mail, I will admit a concern. Luckily, I did not let that initial esponse deter me from reading it. tall towers and knocking them down. as building up, because it was fun, in a different sort of way." Not living with an autistic child means that I am not totally in tune with some of the issues that are inherent in such a family, but my feeling is that this author has clear knowledge of it. She offers the empathy needed to give voice to some of the difficulties, while also focusing on the joys of just being a family. Acceptance of how special it is to have Sammy as part of that family brings the story to a gentle, and comforting conclusion. David Armitage's glowing, light-infused watercolor paintings add a gentle feeling in double page spreads that are warm in color and shadowy enough that they don't bring significant attention to either boy or any of the actions. Rather, they allow feelings to be at the forefront. Lovely! "Maybe I just don't know what real love is. But my feelings weren't just because of the drugs, were they? We hd fun. We had so much fun, base jumping and riding up to Sunday River to go snowboarding, and hot chocolate after his hunting trips, and hanging out in his parents' basement just listening to music and getting stoned." Oh boy! I was so angry with Eleanor when I started readng her story. She is sixteen and her family's rebel. She loves her bad boy boyfriend Lam, who shares her penchant for drinking, drugs and debauchery. Her feelings change from minute to minute; she seems to be consistently trying to convince herself that Lam is a great guy, worthy of loving. Add to that she is pregnant, and both sets of parents feel that marriage is the logical solution to that 'little' problem. Elly's parents are soon off to help orphans in Kenya. Lam's parents run a summer weight-loss camp for kids. The marriage means that Lam and Elly are given a cabin at the camp, and expected to work there through the season. Elly wants nothing to do with it; but, what are her options? Her sister wants to adopt the baby, and even Lam's parents would like to be considered as prospective parents. What about Elly? And Lam? What do they want? Elly finds herself enjoying much about the camp, including the young campers. She gets along with them, and they begin to seek her company and tutelage. She is surprised and pleased with that, while also becoming more committed to her growing baby and its future. Lam is a spoiled party boy who finds it difficult to worry about anyone but himself and his own particular indulgences. Even while he is cheating on her, doing drugs and showing no interest in the baby, Elly thinks that she should be loyal to Lam despite her growing interest in another of the camp counselors. Of course she does, she is only sixteen. It is due to Han Nolan's gifted writing that I changed my opinion of Elly as I read her poignant and uplifting story. The more I knew about her, the more I admired her spirit, her ability to empathize with the young campers in her charge, her honesty and her independence. Once she knows about the pregnancy, she stops indulging with Lam in bad habits, takes responsibility for personal care for the good of the baby, and she begins carefully considering her future. My emotional attachment to Elly and her baby led to tears as I cheered her choices and wondered at her ability to see what was best for herself and her baby. Don't give up on her early (when you find yourself really annoyed at her choices and thinking) or you will miss a powerful story of love and learning. I promise you will not forget Elly....or Emma Rose! "It was an awful shock to have the ground fall away, to be suddenly standing on nothing. I felt my heart push up through my throat as I hurtled down. For just an instant, my eyes were level with Patrick's - and what a startled look I saw! Then he was above me and I was still falling." The Antarctic was a yet unexplored place little more than one hundred years ago. Two men were determined to be first to reach the South Pole, and they resolved to make it a race. What would make Captain Robert Scott choose to take ponies on this treacherous trek? 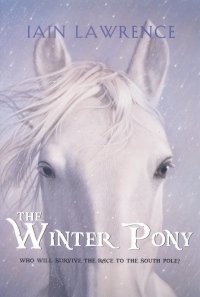 First he had to find the ponies that might endure the cold weather and terrible conditions. He found them in Manchuria and along with sled dogs, he loaded them aboard ship, convinced that they would make the perfect haulers for the many provisions and the plethora of equipment that would need to be transported across the vast ice land. Iain Lawrence has chosen to tell his newest tale in first person narrative....or would I be more accurate in saying first horse narrative? Indeed, it is told from the point of view of one of those Manchurian ponies...named Jimmy Pigg. Surprised? So was I. And, I wasn't sure that I was going to be able to suspend belief enough to make the tale a great read for me. "He was terrified, and the smell of his fear made the rest of the ponies uneasy. The men closed in around him. He ran up against a sledge. He nearly trampled a tent, and all the time kept shrieking and fighting, leaping clear from the ground with his four hooves flailing." "It's October 19 when Amundsen finally starts for the Pole. Now it's spring without a doubt, and there's no thought of turning back. He has no idea how far the Englishmen might have gotten by now, if they've met the same cold that forced him off the Barrier. He thinks of the motor sledges; he imagines their tracks turning round and round, mindless of the temperature." This is a book that is sure to find an appreciative and enthusiastic audience. It is not what a cat is put on this earth to do. Tom knows it, but how can he leave that tiny tweet, with worms galore and no way to eat them? He does what he has to do, although it makes his eyes bug out and his cheeks turn green and puffy. You could read it without sharing the brilliant artwork that Dan Santat has created for this hilarious tale of Tom and his tiny tweet (I do that at times to illustrate to children that the 'best' picture books need both words and art). In doing so, you would miss much of the fun that is there to be experienced, and then savored for days to come. It starts innocently. Tom is on the prowl for food when he spots a nestling in the grass. As he stealthily approaches, he makes the discovery that it is so skinny it would not make for a pleasurable meal. Top that off with the knowledge that the tweet is terrified and alone. There is nothing to do but face the wrath of the maniacal mama bird and attempt to take it back home. Tom dreamed of the tweet? Was he nuts? How completely absurd! he was missing that bothersome bird." The rhythm of the words carries this entertaining romp to a satisfying end, full of humor and heart. The lively artwork gives us characters to love and appreciate. The story will hold listeners attention through repeated readings. I love this book! Welcome back, Bear and Mole! March in Manitoba is snowy, cold and blowy! March in the United States (in a widely affected area) has wrought destruction and dismay as early season tornadoes touch down with enormous force. March has traditionally turned the thoughts of children to gentle winds and kite flying. Bear and Mole are just like kids! 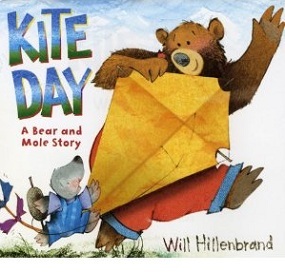 Bear gets a 'whiff' of spring in the air and home he goes to announce 'kite day!' to his friend Mole. Together they spend time doing all that is needed to make a kite that will help them enjoy the return of spring and the shared delight of taking that kite to the meadow and letting it loose. When dark clouds appear, their joy is disrupted and watching their kite break apart and leave them behind is disconcerting. Their race to save it from destruction leads them to discover something quite magical and they are content. This is a 'just right' book for early readers. The short sentences, the repetitive language, the lively detailed illustrations and the expressive faces of both characters help young readers find success in 'reading'. The brilliant blue sky is an open invitation to adventure, and Bear's obvious delight in his discovery hurry him home to Mole. The use of white space in the following two spreads provides for a careful consideration of all that goes into the kite building. The darkening sky as the storm approaches changes mood from exuberance to consternation. Finally, the brilliance of the warm colors in the final spreads takes readers right back to joy and contentment, as the sun peaks through and offers up a big surprise!! Can't wait to see their next adventure. Poor Zebra...all he's trying to do is make a production of the alphabet. The stage is set, the actors prepared, and the action begins. Then, Moose lumbers on stage, in exactly the wrong spot. As the action moves forward from one letter to the next, Moose makes a nuisance of himself while waiting for his turn to be the star. H is not his place; but L is getting closer. He's ready! When M is for Mouse, he has a flip-out! Zebra remains calm and assertive that the correct decision has been made to go with 'mouse'. Can you spell angry? Upset? Discombobulated? 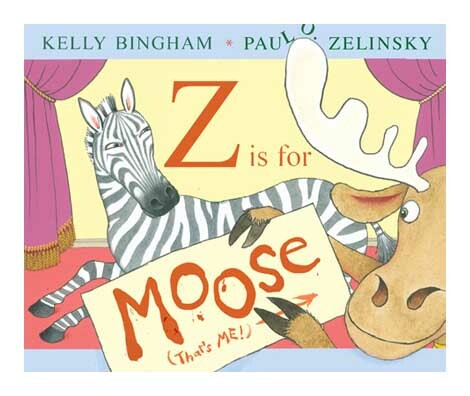 Young readers and listeners will be absolutely delighted with the antics that Moose displays as Zebra does his best to bring the production back to some semblance of order. Finally, feeling sorry that Moose is so visibly and audibly upset, Zebra offers a solution! Just when you thought you had seen every imaginable take on presenting the alphabet in a new and innovative way, along comes Kelly Bingham (in her first picture book) to set you on your ear and make you laugh out loud. Sure to cause the same reaction wherever you share it! Paul Zelinsky adds his droll touches to every page...starting even before the title page with Zebra checking all the actors in for their upcoming roles. Does his referee's outfit hint at things to come? I don't know how he does it; but, he does it every time he puts pen to paper and releases a new book. Kevin Henkes creates spot-on personalities for the stories he wants to tell! Add Penny to your list of favorite characters...Chrysanthemum, Owen, Lily, Bailey, Sheila Rae and Wendell...from this creative and warm-hearted man. This astute author is totally in tune with young readers longing to start reading their own early chapter book. So, he stops there, takes a breath and moves on to chapter two...fade to the dinner table where singing is not allowed. Penny knows the rules and appears nonplussed by the wait. 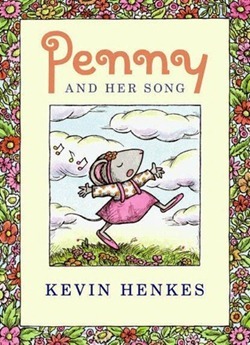 Once the meal has ended, all attention turns to Penny and her song. Mama and Papa listen to the whole thing, and then they listen again. "Mama sang high and softly. Papa sang low and loudly. in their own baby way." "The Meadowlands had deteriorated into one of the worst places in America, and it was giving New Jersey a bad reputation. The state government decided to turn the wasteland into a center for housing, shopping, and entertainment, while protecting parts of the wetlands." 'So, this is the Meadowlands' is what I thought when I opened this incredibly informative and appealing book. I had heard the name on numerous occasions in reference to horse racing, sports and entertainment. I had no idea about its ecosystem. Thomas Yezerski soon changed that. He begins by reminding New Yorkers that they can see this amazing wetland from the top of the Empire State Building. That is not all they can see...there is also an airport, shopping malls, sports facilities. I love the tiny images that decorate this page's border...garbage, mosquitoes, New Jersey Turnpike, mall, warehouse, weeds, parking lot, mobsters, swamps, racetrack, chemical dump, rest stop, football fans and the Teterboro Airport. Kids will love them, too. He uses this wonderful book to trace the history of this environment from earliest times, when the Lenni Lenape lived and flourished within its '20,000 acres of marshes, swamps and bogs that were home to many different plants and animals.' It sustained their lifestyle; providing food, materials for housing and items for trade. As he moves from century to century the author aptly describes the changes that the arrival of Europeans brought about, with their need to clear land for housing and farming, cut trees to build roads for moving materials, build dikes and dams to control the natural vegetation and moisture of the ecosystem, build factories for manufactuirng and refineries to generate power. Each new age had a devastating effect on the natural habitat. 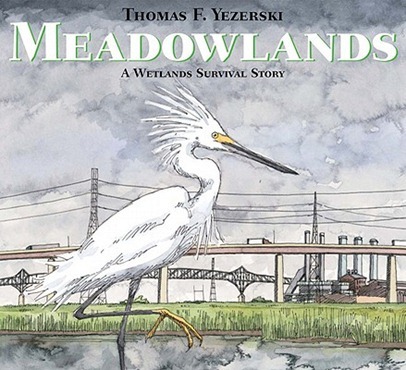 The Meadowlands became a 'wasteland' and nothing changed until the government decided to make a change...and one that would improve the whole area. By 1985, only 7,000 acres of the wetlands remained. "In July 2007, for the first time in fifty years, a young osprey - a bird of prey- leaped out and took flight from a nest its parents had built in the Meadowlands. If a fragile family of ospreys can survive among the reeds and highways, other creatures can return and survive, too." Thomas Yezerski borders his pages of 'just enough' information with tiny spot illustrations of objects that add importance to what he has shared. 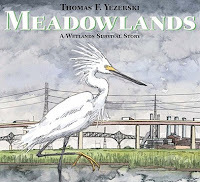 His watercolor artwork gives a clear picture of the changes that the Meadowlands has endured over the course of hundreds of years, and gives hope that it will survive for many more. 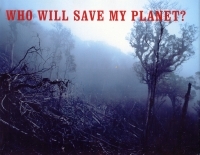 If you are thinking ahead to Earth Day next month, this would be a perfect book to show how devastation and waste can fight its way back to growth and life for the many species indigenous to the habitat being portrayed.